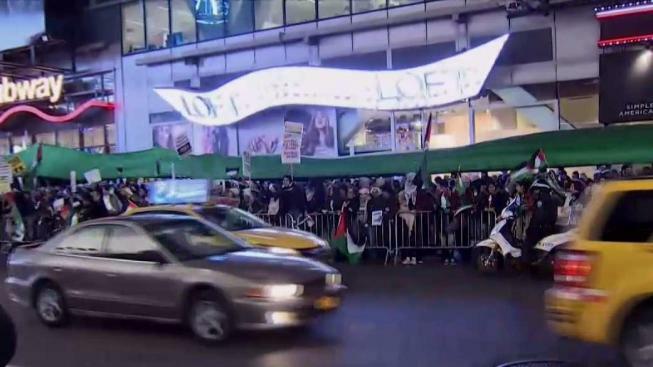 Hundreds of protests took to Times Square Friday evening, two days after President Trump said the U.S. would recognize Jerusalem as the Israeli capital. A large crowd of people descended on Times Square Friday night to protest a decision by the U.S. to recognize Israel’s capital as Jerusalem. Hundreds of pro-Palestinian protesters filled the sidewalks of Seventh Avenue, between 41st and 42nd streets. Down the block, a handful of pro-Israeli counter-protesters gathered to support a decision announced by President Trump earlier this week. Passions were high and some shoving and pushing was reported as the two groups faced off at various points along the street. One person was detained by police, although it’s unclear if he or she was arrested. “The whole world knows that Jerusalem is divided. Some part is for Israelis and the other part is Palestinian. So I can’t all of the sudden come and say, ‘Okay, I’m going to give New York to so and so,” Amal Al-Shrouf, a supporter of Palestine, said. Another pro-Israel demonstrator, Karen Lichtbraun of the Jewish Defense League, said "We applaud President Trump and his announcement." The Times Square protest followed deadly clashes between Palestinians and Israeli security forces on Friday, two days after President Trump announced the U.S. would recognize Jerusalem as Israel’s capital. A 30-year-old man was killed and more than 100 injured along Gaza’s border with Israel, Palestinian officials said. Israel’s military said soldiers fired selectively at two main instigators.